While the double flowered form of this low growing perennial is relatively easy to find, this seed is from the true single-flowered species, and is not common at all. With deep roots, this mat-forming rock garden plant will produce a succession of flowers over a long period throughout much of the summer. 8 inch height/spread. For maximum freshness, please keep seed refrigerated in its original packaging until it is time to plant. Sow seed in containers in a cold frame in autumn or spring. Seed may also be sown where it is to grow in the crevices of a rock wall, or in the rock garden. 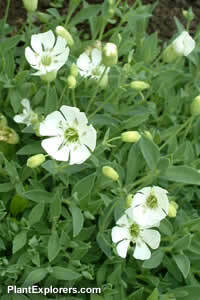 Grow on in any almost soil with good drainage in full sun to light dappled shade.